After doing more research on the Pioneer Databases, I found an article that explains more about the disappearance of the bees. An article on EBSCO said that many hives around the country are experiencing colony collapse disorder (CCD). Hackenberg, a Pennsylvanian bee keeper, had 400 gives on his site and all but 32 hives had collapsed. What was strange about this is that there were no dead bees in sight. Even the moths and beetles that usually raid the hives would not go near the dead bees old homes. They found that high levels of neonics, which are known to disrupt the nervous systems of the bees, can cause disorientation and eventually death. These chemicals have been found in large amounts in pollen, which is the bees main protein source. After doing more research on CCD, they found that more than 170 different chemicals in bees from the affected hives, including fluvalinate and coumaphos, are commonly used by beekeepers to combat varroa mites. 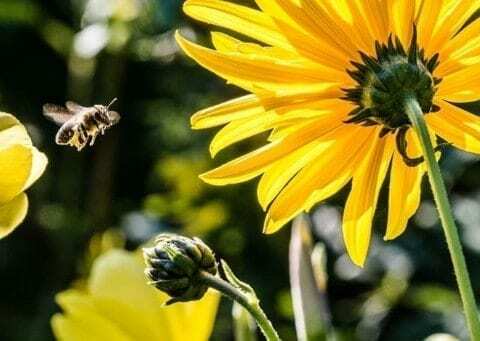 Another source from EBSCO says that growing evidence has suggested that neonics disrupt the normal functioning of bees, making them more vulnerable to ailments that eventually lead to death. They say that more than 90 commercial crops in the U.S. rely on pollinators like bees as well.Another article on EBSCO says that Managed honey bee colonies in the United States have dropped by about half since shortly after World War II, and a parasitic mite that arrived in the late 1980s virtually eliminated feral colonies. Though normal attrition of hives over the winter was once about 5 percent, the die-off of honey bees has been around 30 percent each year from 2007 through 2010, according to Agriculture Department surveys. Save the Bees! (Part 4) by Anna is licensed under a Creative Commons Attribution-ShareAlike 4.0 International License. Partisan Media and Polarization (EBSCO)EBSCO Research: Is 2D Animation Dying? Thank you for writing about this topic! I have heard about the issue of bees dying before but never knew what caused it. This article was very informative! This subject is very important and the world is very ignorant too such issues. Maybe because they don’t consider it very important but it is extremely important. The world has to realise that if bees die off. We wont have access to the abundance of foods that we have. I am surprised by your post. “Save the Bees! (Part 4)” because I didn’t know that high amounts of neonics were found in the dead bees’ hives. One sentence you wrote that stands out for me is, “Even the moths and beetles that usually raid the hives would not go near the dead bees old homes.” I think this is important because if the normality is non-existent, it means that there is obviously something wrong. Another sentence that I liked was, “Though normal attrition of hives over the winter was once about 5 percent, the die-off of honey bees has been around 30 percent each year from 2007 through 2010, according to Agriculture Department surveys.” This stood out for me because it gives a numerical explanation of what is going on. I do agree with you that this is bad for the bees. One reason I say this is because their numbers are quickly decreasing. Another reason I agree with you is their homes are being destroyed. Thanks for your writing. I look forward to seeing what you write next, because this topic is very educational and interesting. Anna, this is a very interesting topic and something I am super intrigued in. It is also something I would like to learn about, and something I would LOVE to fix. Keep it up! great topic! i think this is really important to talk about. you’ve done a great job providing substantial research and evidence to support your claim. Anna, I really like the topic you have chosen. I think this is a serious issue that a lot of people are unaware of. One question I have is: Where are these deadly neonics coming from, and who/ what is the leading producer of them? Anna, this is so interesting! This is also such an issue that we have to make sure we do something about. I can’t wait to read more about this and see what you thesis turns into. Great job!